As the daughter of Johnny Cash, singer-songwriter Rosanne Cash describes her life as “circumscribed by music.” But, it’s through her love of language and quantum mechanics that she’s finding new sources of creativity and mathematical ways to think about the divine. The mother of five shares her perspectives on being present, Twitter as a “boot camp for songwriters,” and how she wrestles with love and grief through her music. Image by Rick Diamond/Getty Images, © All Rights Reserved. 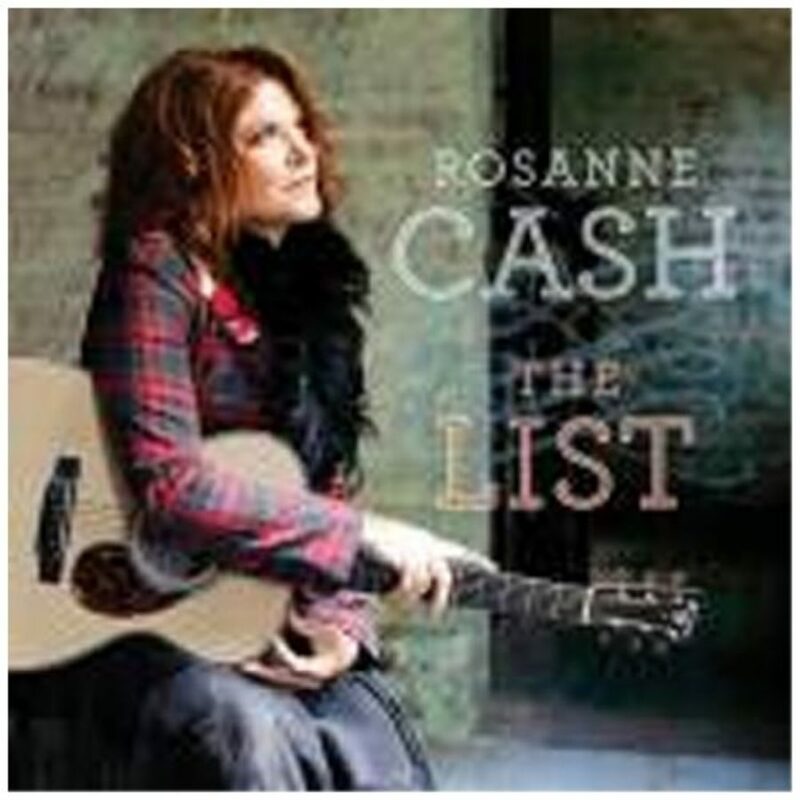 Rosanne Cash is a Grammy award-winning singer-songwriter and author of several books. 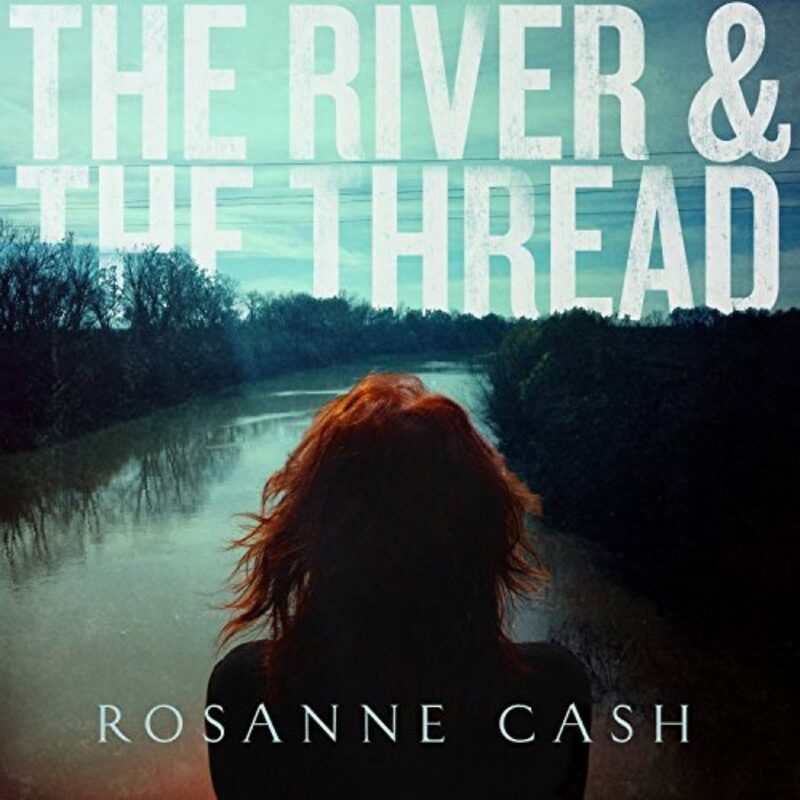 Her latest album is The River & the Thread. 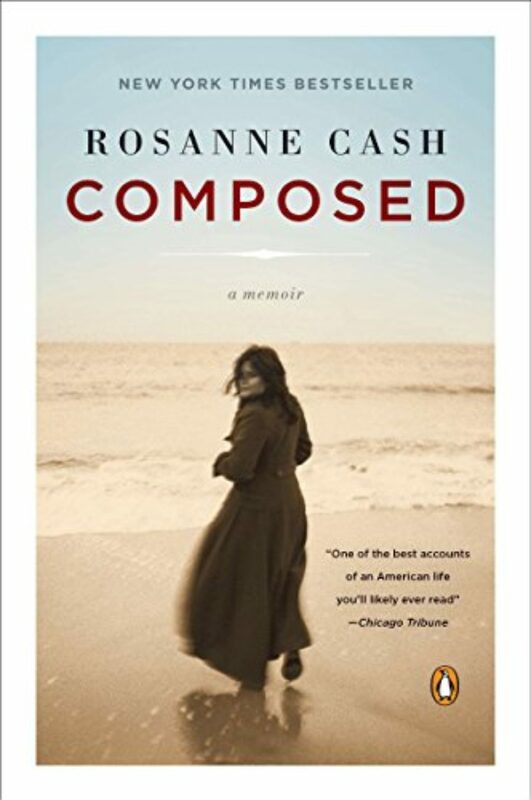 ROSANNE CASH: I want so much to touch those things in my life and in my work, and I just keep looking for the veil to be lifted even in a fraction of a moment you know. I’m always looking for that. That’s my religious desire. KRISTA TIPPETT, HOST: “Mystical” is one of the unexpected words the singer/writer Rosanne Cash uses to describe her father Johnny Cash. But it also applies to this daughter’s mind and spirit. MS. TIPPETT: She’s a mother of five; a lover of language and of physics who surprised herself by becoming a performer. She’s lost her voice for a stretch of years and had brain surgery. The legacy of Johnny Cash weaves throughout a conversation with her. So does his death in 2003, and the “Black Cadillac” album she created from that same period in which she also lost her mother and her stepmother June Carter Cash. 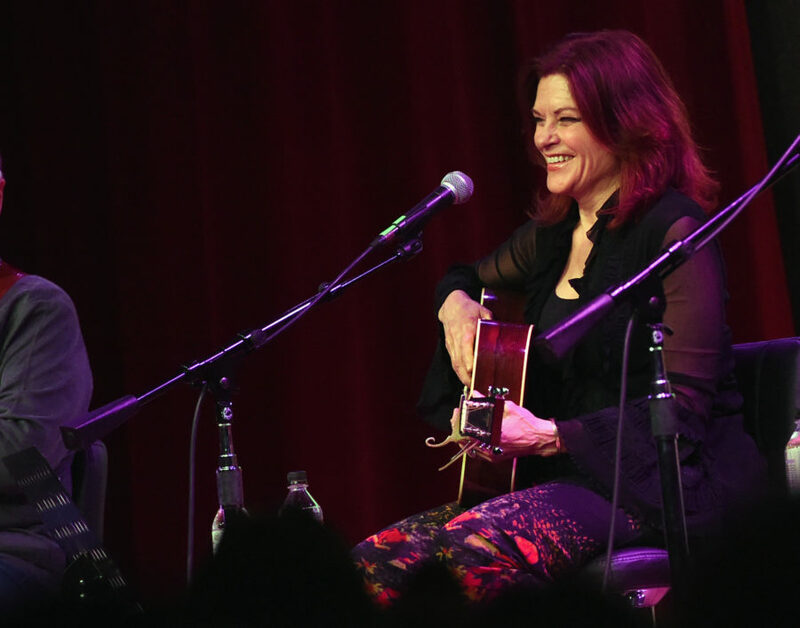 The songs that emerged, like all of her music these days, are full of life in the raw and of some form of “time travel.” That’s a phrase Rosanne Cash likes and gives new meaning. I’m Krista Tippett. And this is On Being. MS. TIPPETT: I sat down with Rosanne Cash in 2011, backstage at Orchestra Hall in Minneapolis. She arrived with her longtime manager Danny Kahn and her husband, the musician and producer John Leventhal. He’s known to her Twitter followers as the mysterious “Mr. L;” and he’ll pick up his guitar for us in a little while. MS. TIPPETT: I want to start where I start with everybody. I just want to hear a little bit about the religious and spiritual background that was there in your childhood. MS. CASH: Well, both of my parents were very religious. My mother was a strict Catholic. My father, even though he was a Southern Baptist, had — he was a mystic. You know, he really looked for the mystical and religion and in all of life. But my father had to sign a paper when he married my mom, saying that he — the children could be raised Catholic. And then when we — my parents split up and we visited my dad in summer. My mother made him promise that he would take us to Mass on Sundays. So he did. He was very dutiful about that, you know. I could — I have to admire that now. He would sit in the back row and wait for us. And when I was about 15, I said, “I don’t want to do this anymore.” And he said, “But, you know, I promised your mother.” I said, “I won’t tell her, if you won’t.” And I could see it was a moral dilemma for him, but he let me stop. MS. TIPPETT: Right. And then the element, which I also think of as a spiritual element of your life was music, right? MS. CASH: Mm, still is. MS. TIPPETT: There’s this phrase in your memoir: “A life circumscribed by music.” So, you know, what was the shape of that growing up? How did that look like to have a life circumscribed by music? MS. CASH: Well, I was really oppressed by what I thought what spirituality was, you know. Sin, original sin — all of these concepts weighed really heavily on me. I took it seriously. And it took me a long time to first start shedding the way I had felt restricted by it and the punitive aspects of it. And then it took me well into my 20s and early 30s to really find something that was mine. And to realize that art and music was the kind of deity I was looking for. That it was all there. The source of all creativity, light, enlightenment, beauty, revelation, inspiration, all those things were in art and music. So I said well that’s good enough for me. MS. TIPPETT: … before — then you became a writer, um, of music and a musician as well. MS. CASH: Yeah. I started writing. I mean I loved language from the beginning. I was a kid who asked my mother to drop me at the library on Saturdays. I was very — I was really geeky. 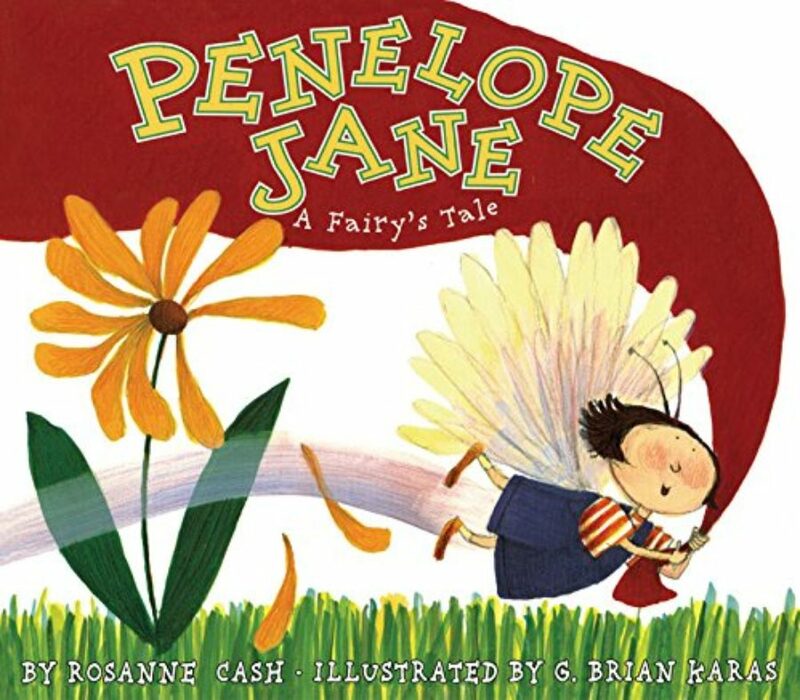 MS. CASH: You know, I just would hole up with a book forever. I didn’t think I would become a musician because I thought that meant that you would have a public life and get famous, and I didn’t want to do that. MS. TIPPETT: Well, you saw that too? MS. CASH: Yeah. I mean my mother’s version of things was that if you, um, were a musician or performer, you were away from home all the time and you didn’t have a private life and you got on drugs and you got divorced and had affairs and, you know, it didn’t sound very appealing. MS. TIPPETT: Yeah, what — what she had — she experienced that right? MS. CASH: … true for her. MS. TIPPETT: It’s so interesting when you — you describe after graduating from high school, you joined your father’s tour. And you also had your own close-up experience of all of that. MS. CASH: Yeah, that lifestyle didn’t appeal to me. What appealed to me was the hard work to show up for my job. And if art and music were the religion, then the hard work was the, you know, the dogma. MS. TIPPETT: Yeah, or the sacrament or the ritual? MS. CASH: Yes, exactly. The sacrament, that’s a better word, yeah. MS. TIPPETT: Mm-hmm. Something else that really interested me, I think this is — I think you wrote about this especially in your memoir. You talked about how your father — in that experience, you really saw how your father was his best self on stage. MS. TIPPETT: And I’ve known performers, also, who are incredibly private, but then they kind of come alive on stage. But something you describe is — it was like there were relational things that happened. MS. CASH: Oh, yeah. Well, he was a special performer, and he took all of his problems to the stage, to the spotlight, you know? It was like, being bathed in light in a literal sense, he really worked things out. He healed things. MS. CASH: He asked June to marry him on stage, you know? MS. CASH: He felt his most natural self on stage, his largest self. MS. TIPPETT: And you also had experiences with him on stage, right? MS. CASH: Yeah. Yeah, I talked about this in my memoir, that the last time he played Carnegie Hall and he wanted me to sing a song with him — “I Still Miss Someone,” which is one of his greatest songs. And I was mad at him for some reason and I said no, you know, what a brat. And then I said no like a couple times — he asked me three or four times and I kept saying no. And then we were at the hotel about to go to Carnegie Hall and he asked me once more. And I said no again, and then he turned — he said OK, and he turned away. And the look of his back struck me, like, ’cause I had seen that angle of his back from the wings so many times and it filled me with so much love for him. It really moved me deeply because that’s — you know, seeing my dad on stage, was seeing my dad. It was really seeing into his soul. So I said wait, I’ll do it, I’ll do it, I’ll do it. And it worked out like I hoped, you know, like I didn’t even know I hoped, but it worked out. I sang with him and it all got fixed. MS. CASH: On stage. That still happens, you know. Sometimes I’m playing with my husband on stage and we’ve gotten in an argument or something or you know, are tired and cranky, and it will all get worked out in some solo he plays or some notes. MS. TIPPETT: But it’s about the music then, not about the spotlights and the audience. MS. CASH: Yeah, it’s about the — no it’s about the music. MS. TIPPETT: Yeah. So the music then kind of transcends even that setting and — is that what you are saying and the fact that they’re there. MS. CASH: Sure. You know when I first became a performer, I was so anxious about it and it took me a long time to grow into it, because I thought that being a performer was about getting a lot of attention and I didn’t want that much attention. I liked the writer’s life. I liked the privacy and the solitude and being inside my own little mind cave. And over time I realized that it’s not about the attention, it’s about the energy exchange. I’m doing something for them, but they’re doing something for me too, you know? And there’s no hierarchy really. It’s — and some nights that exchange is so beautiful, you know, I can feel my own energy stretching out to the far reaches of the room and theirs coming back. And there’s something sublime about it, and also the temporal nature of it that at the end of the night it’s over. MS. CASH: It’s like a monk’s sand painting, it’s wiped clean. And so you can’t grab it, you know, which is part of the — the mystical beauty of it. You can’t repeat it. You know, the next night might be just awful, like, your energy might not expand beyond two feet beyond you and they are not giving you anything and it doesn’t work, but you know, that’s the way life is. MS. TIPPETT: Yeah, it’s that spiritual discipline of knowing impermanence. MS. CASH: Knowing impermanence and showing up even though you don’t know what’s going to happen. MS. TIPPETT: I’m Krista Tippett and this is On Being — with the singer and writer Rosanne Cash backstage at Orchestra Hall in Minneapolis. MS. TIPPETT: Were you surprised at times I mean, you know, when I read about you, you had a lot of reasons to resist going into that same profession that you’ve been surrounded with, and you seem to always have been pretty aware what you didn’t like. MS. TIPPETT: Um, and then, you know, when somebody reads your biography, then suddenly in the ’80s you start having hit songs. MS. TIPPETT: And, um, I don’t know, it’s just — it’s striking. Did you wake up sometimes and say how did this happen? MS. CASH: Sure. I still do. I — yeah, uh, the trajectory of my career and my work has been one of spirals. Like, I had a lot of success in the beginning and not a lot of confidence or mastery in what I was doing. I was just kind of fumbling. So then later on, I had a lot less success, but I developed more mastery and I became comfortable with the idea of not having as much success as gotten used to in the beginning. It all became fine. It all kind of just focused into what my work was, and the reverberations of that were really beyond my control, you know. And there’s a lot of love in that, you know? MS. CASH: Well, my friend Steven Pressfield, he wrote this great book called The War of Art, and he has this great line in it. He says, “You have to show the Muse you’re serious.” You know, you can’t just expect to be hit by these beautiful bolts of inspiration and lightning. You have to keep showing up even if you don’t get hit for a year or two years. Just show the Muse you are serious. And then that the relationship there feels like love to me. I mean, it feels like the heart opening. MS. TIPPETT: … which really is about love. MS. CASH: And time travel. MS. TIPPETT: Yeah, well it’s about love before life and beyond life. MS. CASH: And then it started developing, I didn’t know where it was going. And then I saw three verses: one before life, one during, and one after life, and that love was the constant. You know, and that what survives of us is love. It’s like that Phillip Larkin poem, so the song was kind of there. MS. CASH: Sometimes I think songs are there in the ether and you just have to have your skills good enough to get them. MS. TIPPETT: Right. You — you used a phrase somewhere, the same phrase that Bobby McFerrin used with me, that you catch songs. MS. TIPPETT: Which is a similar image. MS. CASH: I was just going to say you have your catcher’s mitt on. MS. TIPPETT: Which is just fascinating to think about. MS. CASH: Yeah, and sometimes I’m afraid that if I don’t get it down, then somebody else will get it. MS. CASH: Like, I don’t want, you know, I don’t want Lucinda to get this one. MS. TIPPETT: Right. So, you know, this — I didn’t expect to think about this, but something that I’ve talked about with scientists is, um, there’s this debate in science about whether — like, say whether mathematics is invented or discovered. Do we come up with it or is it, you know, is it somewhere — is it somewhere in the fabric of the universe and we’re able to turn it into an equation? And it seems to me that it’s a similar idea to what you just said. MS. CASH: It’s the same thing and now you’ve stumbled on an area that I’m endlessly obsessed and fascinated with. Because fractals in nature, that perfection of math, that to me is God. And that’s the same thing as art, you know, that there’s some creative force that organizes all of these things. And like you just said, we glimpse it. We can just a little bit see it, you know, and understand it. And our math is like the fumblings of a, you know, a toddler trying to talk about something that already exists that’s so perfect and so complicated and full of so much mystery that we can barely touch it. MS. TIPPETT: And, you know, some of the people I trust the most to wrestle with this question of invented or discovered, well what they’ll say is it’s both, right? MS. TIPPETT: Which is a way of talking about creativity as well? MS. CASH: Yeah. Sure. Because if you don’t have the skills to interpret it or bring it into being or create it, you know, then it’s somewhere else. It’s still out there, but it’s lost. MS. CASH: Well, then there’s also that, you know, the unknown element of genius. There are some people, some writers, some songwriters I admire that I consider genius and that I’ll never be — no matter how hard I worked, I wouldn’t have the skills to catch those songs. MS. TIPPETT: Is that how you think of it? MS. TIPPETT: Right. And a physicist will say only an Einstein could write E=mc2. MS. CASH: Yes. Right. But I could, you know, I could work on my own skills enough to get the best songs I could possible get. MS. CASH: And that’s what I’m doing. That’s my life. MS. CASH: Mm-hmm. It would be trite. MS. TIPPETT: It’s very, very, very simple. So there’s something that you do that is different when you turn words into song or that the music transforms the mere words. MS. CASH: Absolutely. Some of my songs wouldn’t stand alone as poetry, Some would, I think; some wouldn’t because of the very thing you are talking about. Because they are so, um, bound to the melody or the backbeat, you know, that they can’t be separated. I’m about to do this project with a painter I know. He wants to use my lyrics and do paintings with them — like include them in the paintings. I was a little worried about that in the beginning, like, what would the lyrics stand alone. Let me pick the lines, you know, but, um, yeah, I mean, that’s by nature — the definition of songs is that the music is half of it. But you said now, that “God is in the Roses” was the most, quote, religious song. MS. TIPPETT: Well, it — it’s an overtly religious song. It’s a God song. MS. CASH: Yeah, yeah, except the imagery in it is not necessarily religious, because, um, you know, the last verse about — the middle verse about being in the cemetery. “The sun is on the cemetery, leaves are on the stones, there never was a place on earth that felt so much like home.” That came because the day after we buried my dad, I got up at 5:00 in the morning and waited for the Starbucks to open and got coffee and went and sat on his grave and watched the sun rise — the sun, yeah, the sun rise on his grave. And it was really comforting to me. I took two cups of coffee. MS. TIPPETT: So you could stay for a long time? MS. CASH: No, for him — one for him. MS. TIPPETT: Oh, you did, really? MS. CASH: Yeah. And I felt so at peace watching the sun rise on his grave and then that gave me that verse. But then I wanted to go out to, you know, more than just my personal experience, when I’m saying, I love you like a brother, father and a son. And now when I sing that live, I sing, I love you all like brothers. MS. TIPPETT: Hmm. How did that happen? MS. CASH: I don’t know, because I feel a lot of peace and again love when I sing that song, and compassion for people who have lost people. MS. TIPPETT: Yeah, that would be great. MS. CASH: Do you want to play it? MR. JOHN LEVENTHAL: Um, sure. MS. CASH: So the reason I asked John to play it — I wrote this song on, um, you know, like I wrote it like a little folk song. And then when we recorded it, actually Bill Bottrell produced this, you know, he transcended it into something else. And then John when he plays it live transcends it into something else too. MS. CASH: Your Web viewers are going to enjoy this tuning moment. MS. TIPPETT: Yes, they will. They will actually. All right. MR, LEVENTHAL: Are we ready? MS. CASH: Well, yes. Although, I hesitate to say that, because to just think of it as therapy or catharsis diminishes it to me, because, you know, it’s suppose to be a work of art and music and that’s beyond therapy. I mean, just to say it’s therapy is, you know, it’s just narcissism then. But the bigger answer is yes, of course. And a lot of times, I don’t even know what is going on until I write about it. And sometimes it’s even outside of linear time and then it happens later on. And I say, “OK, that’s what it’s about, that’s where, you know, what’s happening. That’s what’s coming up.” Yeah, getting it on the written page, finding a melody to put to it, that organizes my life and keeps me sane. MS. TIPPETT: Right. I guess I imagine that you put an end to a project like that. I mean, obviously the loss doesn’t end, the mourning doesn’t end, but you — I can imagine that you walk away from that project still different. You’ve walked through the experience with tools that everyone doesn’t have to turn it into art. MS. CASH: Well, I do remember when I was writing the songs for “Black Cadillac” feeling really sorry for my sisters that they couldn’t write songs, because it gave me a lot of relief. It was just this intense pain, and to write a song let me know that there was still something alive in it, you know? MS. CASH: And “God is in the Roses,” um, was because in a moment of real mourning and loss, I still felt the presence of light. And I thought, wow, there’s a conundrum, you know, but it exists, that even in the darkest, darkest times there’s this overriding — light is the only word I can think of to put to it. I mean, I guess some people would call that God. MS. TIPPETT: We live-streamed my entire backstage conversation and musical encounter with Rosanne Cash. You can watch it now at onbeing.org. 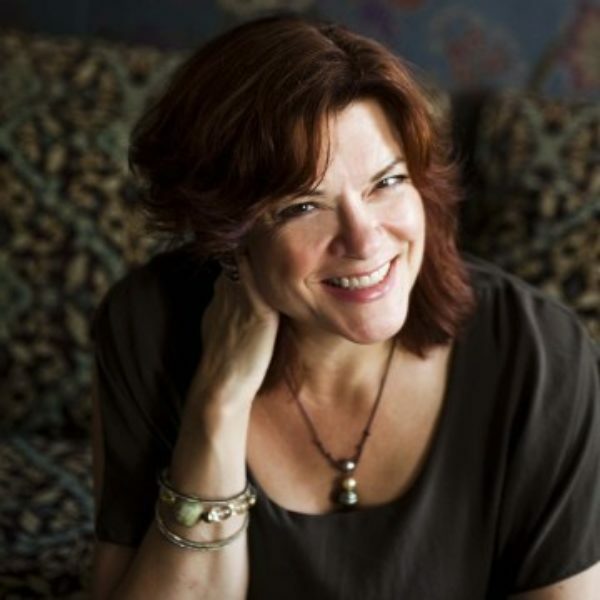 MS. TIPPETT: Coming up, Rosanne Cash on how the “café society” of Twitter has enriched her life; and the backstory to her Twitter self-designation as Buddhiscopalian. MS. TIPPETT: I’m Krista Tippett and this is On Being – Today, “Rosanne Cash, Time Traveler.” I sat down with the writer, musician, and Twitter poet at Orchestra Hall in Minneapolis. The memory of her father Johnny Cash weaves throughout our conversation, as does his death in 2003. 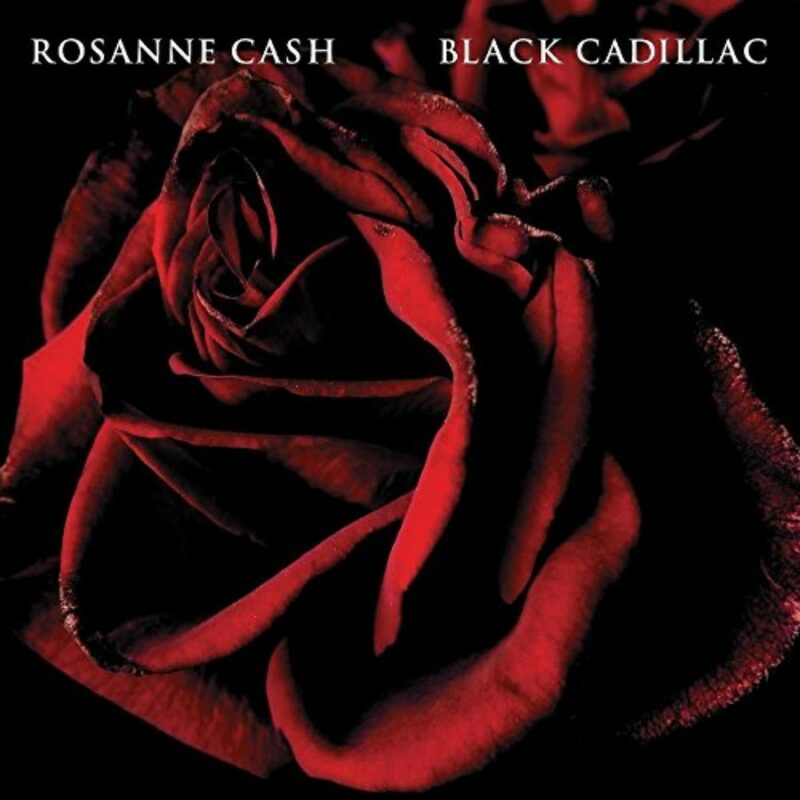 Her 2006 album, “Black Cadillac,” was borne of that grief and love. 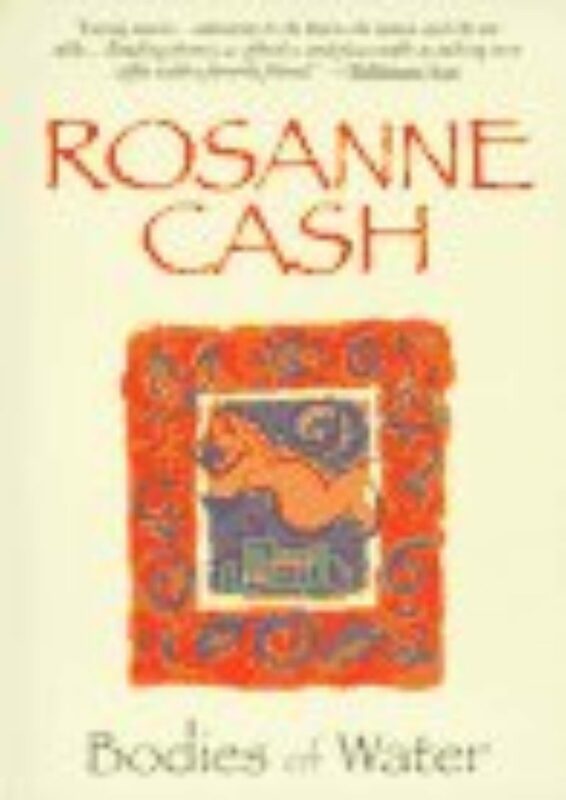 I wanted to get close to this personal, reflective even mystical side of Rosanne Cash. And she let me. MS. TIPPETT: I mean we’re talking about this entire time — I would like to just ask you how your sense of the meaning of making music — the practice of music, I mean, how your sense of that has changed across time. I see, I think, we are already there, we’re already in that, but have there been some other turning points, um, big realizations? MS. CASH: Well, sure. Well, I loss my voice for two and half years, and that was a huge turning point for me. And I said to myself, if I ever get it back, I’m not going to take it for granted anymore. And you know, I pretty much kept that promise and not to criticize it in my head constantly. And so I’ve let a lot of that go. But also, I this dream I had that, you know — I was in Jungian analysis for 10 years, and it’s great for creative people because it’s all about mining your dreams and, you know, externalizing things you have in yourself and, you know, kind of making them people and talking to them — and all of this great creative work that led to a lot of songs for me. But Jung said that a person will have five big dreams in her life. And there’s this dream about art that was my first big dream or maybe I had one before that, but — in childhood but I don’t know. But it was about seeing Art at a party, this old man named Art, and he turned his back to me and he said we don’t respect dilettantes. And it crushed me. I woke up from the dream crying. I was crushed. And also really scared that I was leading myself into an ever-narrowing kind of corner with my work and that if I just kept dabbling in, you know, trying to make hit records and not really going deeper into what I did and trying to develop some mastery of it, that that was it: I was going to end up doing parodies of myself. And it woke me up. And I started taking voice lessons and I started painting to see what it felt like to have the absence of words, you know, and to learn what I did in songwriting. I did the same thing in painting. You know, I set up all of these kind of lessons for myself. And I’ve never forgotten that dream or the lesson it imparted and I’m scared to loose it, I’m scared to dream of Art again and have him turn his back to me. MS. TIPPETT: How old were you when that was happening? MS. CASH: Oh, I was 33. MS. TIPPETT: So you still have three big dreams left. MS. CASH: I guess I do. MS. TIPPETT: And then of course you had this brain surgery? MS. CASH: Yeah, I had brain surgery. MS. TIPPETT: That was later? MS. TIPPETT: Did that — was that the precursor of the fractals? MS. CASH: No, because I was — I’ve always been interested in quantum mechanics. And even when I was 24, I kind of had a newborn baby and I marched myself down to the community college to see if I could take a course in quantum physics. And I read lay books on physics that I could understand. And, you know, I have a couple of friends who are physicists, and they will deign to dumb down to me and try to explain things to me. There’s such poetry in quantum physics, though. The language is so beautiful and the concepts, you know: Schrödinger’s Cat — is the cat there, is he not there? The cat is dead and alive at the same time. MS. TIPPETT: Right. There’s so much creativity implicit in it. MS. CASH: Right. It’s so beautiful. And then, you know, the fractals — that kind of perfection opened my eyes, when I first realized that that was something that existed. It was almost frightening, like, I can’t even grasp this. But science and quantum science particularly — that is like a religion to me, you know. And I started to think — I really believe now that when people talk about heaven, they’re talking about a parallel universe. MS. TIPPETT: Right. You know, one of the things I didn’t want to do, when I though about interviewing you, is asking you the questions I think you get asked a lot. MS. CASH: Sure. Well, I went on the road with my dad directly after high school. I was 18, and I learned how to play guitar on that tour. I was so into it and I was so into being with my dad for a long extended period and immersed in his life and there were long hours on the bus and we would play songs. He would play songs with everyone, and he said to me — one day he said, do you know such and such a song. I said, “No.” And he looked a little alarmed, he said, “Do you know this song.” I said, “No.” Then he got really worried and he spent the rest of the afternoon making a list for me of what he called 100 essential country songs. And he gave me the list and he said this is your education. And I wanted it. I think that even if he’d given it to me two years earlier, I would have been like a teenager, like, “Oh, OK.” You know, but I wanted it. I was learning to play guitar, I was — wanted to be — I could sense that he was giving me a huge part of himself. And so I saved the list and I did learn the songs. I did learn the songs. And I put the list a way and I just where ever I moved, I carried it in my box of letters and memorabilia and didn’t think much about it. And then after “Black Cadillac”, it was so intense, such an intense experience emotionally, you know, and to do those songs about mourning and death every night it was just — I was exhausted at the end of it. And I said I want to make a cover record next. And John, my husband, said, “Well, if you are going to make a cover record, it’s got to be the list.” And it hit me: Well, of course. MS. CASH: And the other thing that hit me at the same time is that, if I didn’t claim my own legacy someone else would co-opt it. It would happen. MS. CASH: Why was I pushing away this thing that was so essential to my own nature, that was important to my children? It was time to claim it. MS. TIPPETT: I’m Krista Tippett and this is On Being — with the musician and writer Rosanne Cash backstage at Orchestra Hall in Minneapolis. MS. TIPPETT: So let’s talk about Twitter. I mean, this is another thing. Are you surprised? Well, first of all none of us would ever have imagined Twitter. MS. TIPPETT: But this has become I would say especially with you, it’s — you have a big Twitter presence, it’s a big part of your public persona? MS. CASH: Yeah, I don’t do Facebook. I don’t — I mean the record label does; I don’t go on there. Twitter seems perfect for me. It’s, you know, 140 characters, as Mike Doughty says, “It’s boot camp for songwriters.” If you can say it succinctly and somewhat poetically or with humor in 140 characters, that’s great for refining the skills as a songwriter. And also, I mean, much more than that, the café society that Twitter is, is so wonderful. MS. CASH: I have met, you know, professor of philosophy, other musicians, writers, moms, doctors, tons of media people. It’s really great. And I’ve learned a lot. And made real friends, you know? MS. CASH: Well, yeah, also because I’m a geek and I like really geeky things. Like they posted a periodic table that was interactive. I was just on that like a game forever. And, you know, the whole Jane Austen thing: I try out my Jane Austen persona on Twitter, which is really fun and that also helps hone language too. And I love language. It’s — it’s fun. And the one of the really fun things that has happened on Twitter recently is, I met this woman who is a knitting teacher and she writes knitting books — Kay Gardiner. And I asked her to give me a lesson. So I learned how to knit from Twitter. MS. TIPPETT: You had to connect. MS. CASH: Right. We fist met in a coffee shop so I could make sure she wasn’t a psycho. MS. CASH: And then she came to my house. MS. TIPPETT: And you do describe yourself there as a neo-folk, Buddha — Buddhiscopalian? MS. TIPPETT: Pagan, post-feminist, progressive. Did I get it right? MS. CASH: Yeah, that almost covers it. MS. TIPPETT: Also, impermanence that we talked about. MS. CASH: The impermanence, right — performance, right. But, you know, compassion, nonviolence, what else do you need in a religion? I don’t need to play team sports in a religion. And Episcopal, because my girls went to an Episcopal school and I loved the church — it’s in Greenwich Village and they do a lot of outreach to gay, homeless, young people. So that’s a progressive church; they’re very ecumenical. MS. TIPPETT: Mm-hmm. There’s somewhere that you — you use this phrase “the pantheon of my religious desires,” which is also another way of evoking that list. MS. CASH: Yeah. Yeah, religious capital R, not religious as in religion so much as in that great expanse of creativity and spirituality that is all the same thing to me. MS. CASH: And I want so much to touch those things in my life and in my work, and I just keep looking for the veil to be lifted even in a fraction of a moment, you know, I’m always looking for that. That’s my religious desire. MS. TIPPETT: Is mystery a word you use? MS. CASH: Carefully. I use the word mystery carefully. There are mysteries, you know; fractals are a mystery. And songwriting is somewhat mysterious — there are mysterious moments. And I like living with the questions, rather than the answers. Tom Waits said this great thing about songwriting. He said he was driving in a car on the freeway and he got an idea for a song and it was just, you know, like overwhelming him, the idea for this song, and he couldn’t get a pencil and there was no paper. And he’s on the freeway and he finally just looked up at the sky and said, “Don’t you see I’m driving?” And I feel that way sometimes too. Don’t you see I’m getting my child off to school or helping with homework or, you know, just trying to be available? MS. TIPPETT: Mm-hmm. One thing that I think is really intriguing in your stories — that I want to ask you about is your — is the sense of place in your life in music. I mean, you were born in Memphis, but then you moved to California. But what’s more obvious is this Nashville-New York axis. MS. TIPPETT: And then I — I also think of this in the sense of place category: You went and sang at Folsom Prison, you and John, this March 2011. MS. TIPPETT: What was that like? MS. CASH: That was a time travel experience too. Some of these experiences that have this sense of mystery about them like that have something to do with time travel. It’s so strange. We went there — they asked us to play for and to speak with their music and art program and — in maximum security. So we went and we played some songs for them. They played some songs for us. A couple people read poems. They asked questions, you know, it was a true give and take. And they had been very carefully vetted, the men who came to this. And it was very moving. And one man said to me — you know, my — of course, you know, my father recorded this famous record at Folsom. MS. CASH: He spent virtually his entire life imprisoned and he, you know, that in itself was very moving. Then the guards took us over to the old dining hall, the old prison where my dad had recorded the album. Oh, that was a moment out of time. It — I just can’t tell you the feeling of that. It was — it was time travel. MS. CASH: There’s some of it on YouTube? MS. TIPPETT: Yeah. It’s just a snippet, but — but what I noticed, I mean, I saw how moving it was for you, what you’re describing now, but they also would pan to the men’s faces, you know. I mean, they were just soaking this up, right? MS. CASH: Well, I was too, you know, and one guy said to me, he said, “Could you ever imagine being in my place?” And I said, “Man, some days you have more internal freedom than I do.” And it’s so true, so true. We create our own prisons, don’t we? MS. TIPPETT: Hmm. Wow. So I want to just end by just asking, you know, where — what you are thinking about now, where’s the — where do you see the veil lifting in unexpected places now? MS. CASH: I think about my children and how I’m the middle of this ongoing story of my family. I’m not the end of it. And I’m interested in what they’re going to do. One of them is a musician and one, you know, I still have a young child at home, my son, who’s 12. And every single moment with this kid is precious to me, because there’s no wall between me and my own mortality anymore. You know, both my parents are gone and I feel this urgency to complete the things I want to complete. And in the same way, I just feel like I’ll never read all the books I want to read in this lifetime. I’ll never complete all of the projects and write all the songs I want to write. So I started taking music theory again and piano lessons just so maybe it will be a doorway to go deeper into something. And I feel more excited about it than I did when I was 14. MS. TIPPETT: Hmm. I think that — that’s your last word. Anything else — is there anything else? MS. CASH: Well, a song. MS. TIPPETT: Yeah, a song. MS. CASH: I’m going to do “The World Unseen.” This is also from “Black Cadillac”, and the first line, “I’m the sparrow on the roof,” is from the Psalms. And in the last few months of my dad’s life, I read Psalms — the Psalms to him. And I don’t think I ever realized how poetic the Psalms were. And then this line about being a sparrow on the roof just killed me. So after my dad died, I wanted to start the song that way. MS. TIPPETT: Rosanne Cash is a Grammy-winning singer-songwriter. Her new album is called “The River & the Thread,” and she’s the author of a few books, including Composed: A Memoir. MS. TIPPETT: Finally, don’t forget that there’s now an On Being app in the iTunes store for free, download it and send us your feedback and wish list as we develop the next version. MS. TIPPETT: On Being is Trent Gilliss, Chris Heagle, Lily Percy, Mariah Helgeson, Chris Jones, and Julie Rawe. Special thanks this week to Danny Kahn, John Leventhal, Sandi Brown and Orchestra Hall in Minneapolis. What do a fiction writer and an astrophysicist have in common? Marilynne Robinson and Marcelo Gleiser connect the dots between the cosmos, our minds, and all the ways we discover the story of where we came from.